I happen to have this thing for meatballs. Well, it's not a thing, I happen to love them. There is a local modern Italian place I enjoy, and no matter what I order, I follow it with a side of meatballs. I can't resist even when my stomach tells me no. So while waiting in line at the butcher, I spied some meatballs on one side of the counter and grilling planks on the other. As my eyes dart back and forth like I'm watching a tennis match, I think to myself, "Why have I not planked meatballs?" As I look around to make sure I didn't actually say that out loud, I grabbed the meatballs and headed home on a mission. I’m always looking for new ways to add flavor to routine foods I grill and more often than not, I find myself using a Weber Cedar Plank to accomplish this. The smoldering plank wraps whatever I’m grilling with the sweet & subtle taste of smoke. Proving my point, I’ve found the planks work exceptionally well with meatballs. 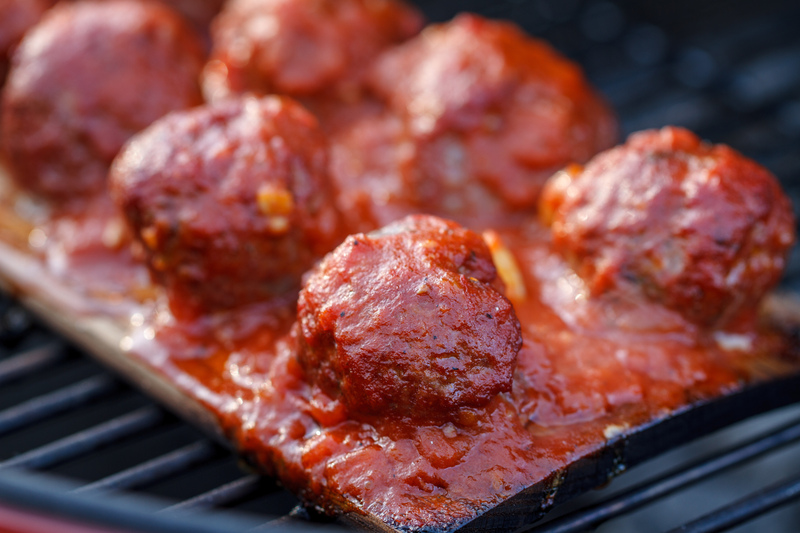 From an ease of grilling standpoint, it’s simpler to load a plank with meatballs, then it is to place meatballs on the grill grate individually. Better yet, perfectly spaced meatballs soak up the plank’s smoke and also allow the addition of a sauce, while the meatballs are still on the grill. Whether your meatballs are store-bought, or homemade, the process is the same. Prep the grill with a two-zone fire for both direct and indirect medium-high heat, 350-450° F.
Place the meatballs on a soaked plank and season to taste with salt and pepper. Place the plank over direct heat and grill, with the lid closed, for 15 minutes. Slide the plank to indirect heat. Top the meatballs with marinara sauce. Lower the lid and grill an additional 10 minutes. Top the meatballs with the grated cheese. Grill an additional 5 minutes, or until the internal temperature of the meatball reaches 160° F with an instant-read thermometer or iGrill 2. This is my go-to method for grilling meatballs. Once you try it, I’m sure it will be yours too.